The health benefits of parsley are not well known, although it is widely used as a culinary herb. However, it is believed to have a wide variety of medicinal uses. The herb is easily grown and one of the most common herbs found in gardens. It was used medicinally by the ancient Greeks and became a popular in cooking in the Middle Ages. Combating the symptoms of anemia due to the high iron content. It is also high in vitamin C, which allows for easier absorption of iron. Parsley is a natural antioxidant, which helps the body rid itself of toxins. It has antibacterial properties, which make it useful against conditions such as bad breath. Parsley is recommended after eating garlic to remove the odor. It is thought to be beneficial for keeping the blood vessels in good health. Drinking parsley juice or tea is considered to be an excellent remedy for diarrhea. The benefits of parsley extend to the digestive system by improving the way fats and proteins are digested. This is therefore excellent for the liver, which helps the body get rid of waste products. It is also a natural diuretic and has a positive effect on the kidneys. All of this means that it can also help with weight loss. 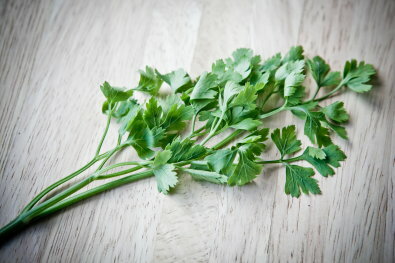 People have used parsley to encourage the removal of cholesterol in the veins. It is beneficial for those who suffer from gallstones, as it can aid in dissolving them. Parsley can have a positive effect on estrogen production and improves blood flow in the uterus. Those who are having problems with menstruation or menopause may find parsley of benefit. The high levels of vitamins and minerals make it beneficial for the immune system. Parsley can be applied externally to insect bites to reduce inflammation. The volatile parsley oil is thought to be an aid in the prevention of tumor formation, particularly in the lungs. Parsley can be taken fresh or as a supplement. Parsley powder is available in capsules, or the fresh herb can be made into a juice and combined with the juice of other vegetables for maximum benefit. Some varieties of the herb are grown for the parsley root, which can also be used in cooking and offers the same benefits as the rest of the herb. Parsley root can be eaten as a vegetable in a similar manner as carrots or celery. The herb should be avoided by anybody who has an existing problem with the gallbladder or kidneys. There is also the possibility that too much parsley could interfere with the absorption of calcium, but it would have to be an excessive amount for that to occur. Due to the effects the herb has on the uterus, it is recommended that pregnant women do not use parsley in concentrated forms beyond normal culinary use. Parsley oil should be used with care and under the supervision of a medical practitioner, as it may have a toxic effect.